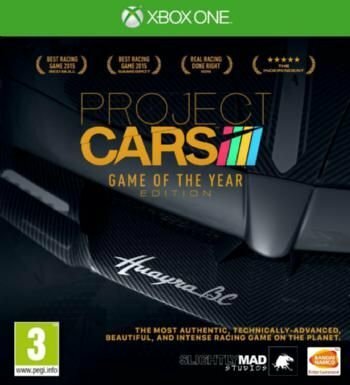 The Game of the Year Edition is both a celebration and a thank you, from Slightly Mad Studios and BANDAI NAMCO Entertainment, to the racing community around the world as they have made Project CARS into the start of an exciting new franchise, and the leader in the sim racing game genre. Create a driver, pick from a huge variety of motorsports, and shift into high gear to chase a number of Historic Goals and ultimate recognition in the Hall Of Fame. Then test your skills online either in competitive fully-loaded race weekends, leaderboard-based time challenges, or continually-updated community events. BEYOND REALITY: Next-generation graphics, dynamic environments, visceral sound, and authentic handling! Playable at either cinematic 12 K Ultra HD resolutions, via Oculus Rift/Project Morpheus, or everything in between... Project CARS goes beyond reality to provide unrivalled immersion. BY RACERS 4 RACERS: Crowd-powered by racing fans that have been instrumental throughout the development of the game by guiding, testing, and approving it, Project CARS has also had continual insight from a wide range or real-life drivers offering their expertise and knowledge to make the game authentic, desirable, and deep. YOUR JOURNEY, ONE DESTINATION: Featuring the largest track roster of any recent racing game, a huge variety of motorsports and car cultures, and unique priority-requested features from the community (dynamic time of day & weather, pit stops, full race weekends...) Project CARS is the premier choice for racing fans.